Nifty 60 min zone map. 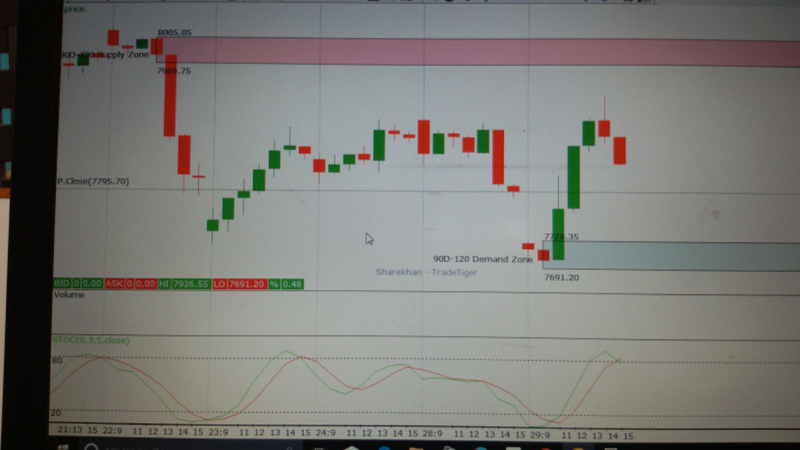 Good demand zone near 7730. Prepare your trade plan for tomorrow. Tomorrow markets shall enter in new F&O series. Immediately on 29th Sep we have RBI meet. Sentiments are mixed on rate hike issues. 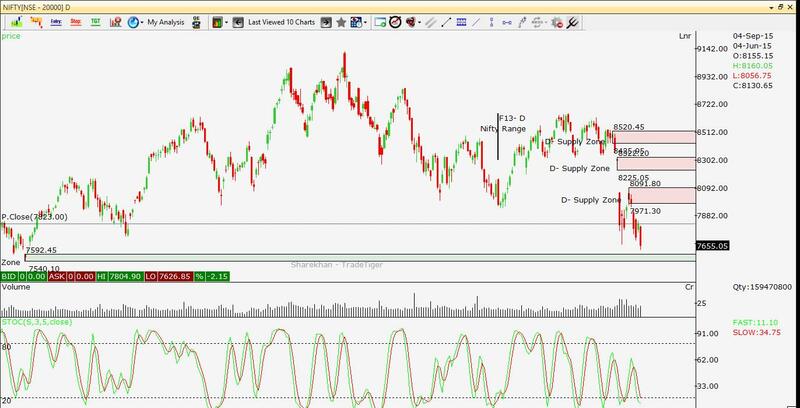 How to trade Nifty in such scenario. 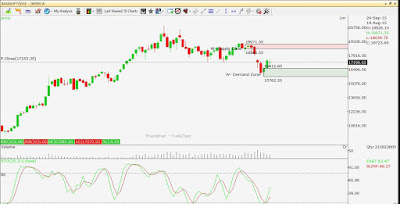 Technical Overview: Last week Nifty made high of 8021 and low of 7723 A range of 298 points. Last week's rising spree is broken by "Bearish Harami" on weekly chart. The kind of chart that is formed is giving me no indication. It is giving me the feeling of confused sentiments. Larger time-frames (monthly and quarterly) are not giving any indication of markets moving up. The gap which I had mentioned in my newsletter that was sent in first week of Sep is filled. If markets are to break 7539, we shall have next target of 6800 coming on Nifty. If something positive comes out of RBI meet, Nifty can move up to 8200. At this level it has strong resistance. This strategy is called as Iron Condor. Works better with non-directional view. 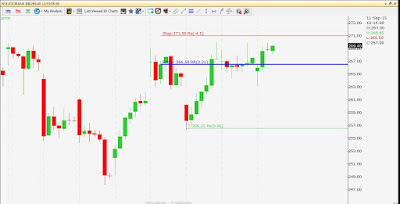 Read here how my trade made 3.4% in 8 days in Sep15 series in Iron Condor trade. Iron Condor is a beautiful Non-directional Options strategy. This strategy can be traded almost in 10 months out of 12 in a year. Winning ratio can be as high as 90%. This is what you can do to trade this strategy. 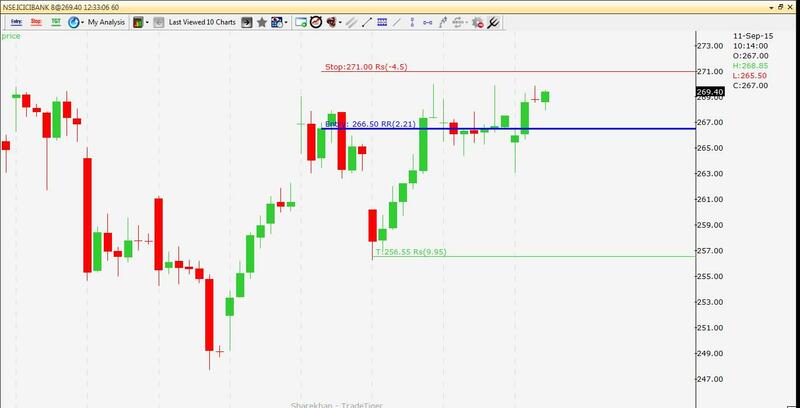 Identify Support and Resistance on Monthly (Sometimes Weekly) chart of Nifty. One can use Demand Supply techniques which I teach in my training to identity. 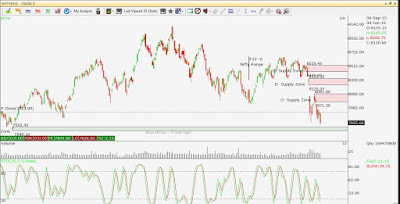 Or if you know Technical Analysis- identify it based on traditional Technical Analysis. Equal number of lots for all strike prices. This is credit spread where one gets net premium. One can use difference of 200 points on Call and Put side. In above example I took it 100 points based on Demand and Supply ones on my charts. This helped me get little higher premium than the case explained above. For trader to earn profit in this strategy Nifty need to expire between two strike prices. Loss is restricted by 8100 CE bought and 7400 Put bought. September trade earned my profit of 3.4% in 8 days. You can trade Options conservatively to earn 3-5% profit per month. This can be a good passive income. Let me know if you like this article. Broad range for Banknifty for cople of weeks 16600-18500. Trading at lower end. Can we expect bounce from here? Booked profit of 10900 in ICICI BANK on 10-Sep-2015. ICICI BANK SELL Recommendation is from our Prime Future Portfolio. We had Recommended delivery SELL on 9-Sep-2015. Booked profit of 10900 on 10-Sep-2015. Nifty is expected to trade range bound with positive bias till coming Wednesday. We have market holiday on Thursday. Friday - expect a very volatile market on Fed Interest Rate news. Nifty has strong resistance at 8000. This is painful. Global markets are pulling Indian markets badly. Markets are not sustaining the slightest of gains. Do we say that the downside is over. Or is there more pain. Technical Overview: Last week Nifty made high of 8043 and low of 7627. A range of 416 points. As indicated in last post, Nifty could not sustain the gains. The close is below last week's low. Volatility is very high. India VIX is trading near 26. This is not great trading market. There is a leftover gap at 7593-7540. Nifty may attempt to take support near this level. However trading is not advisable till the markets give stability indications. Nifty charts are discounting the Technicals to trading on global cues. Short Term (Few days to a Week) : A risky trade only for aggressive traders. 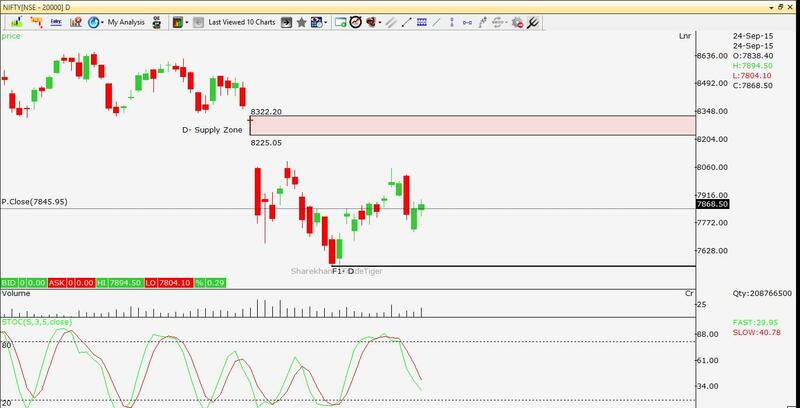 If Nifty gaps down in the zone of 7593-7540, one can go long in Nifty with strict stoploss 7535 with a target of 40-50 points. Medium Term (Few weeks to a month): More wait is advised here. Long Term view on markets (Few months to Year): Go through if you have not read the long term view last week. After long I am elaborating this section in the newsletter. Well do we say Nifty is in long term downtrend? I have this view: Wait patiently for some more time for Nifty to give us clear indications. So far it does not seem to be anything like downtrend here. This can be seen as opportunity to buy value shares for long term. However markets may not immediately move up now. Further downside though possible, may not be substantial. There is not hurry for buying value shares too. Markets can correct further a bit. So wait patiently for them to give us signals then one can start buying. Booked profit of 3.02% on 3-Sep-2015. BANK BARODA BUY Recommendation is from our Prime Future Portfolio. We had Recommended delivery buy on 3-Sep-2015. 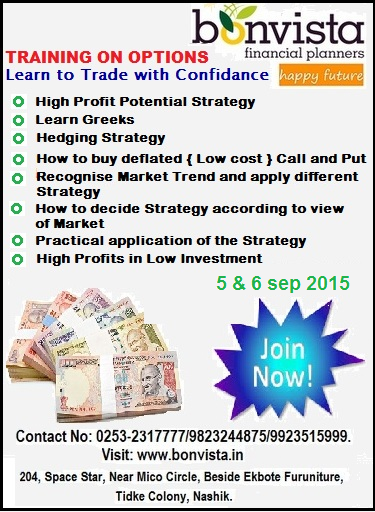 Booked profit of 3.02% on 3-Sep-2015.